Rockford Components has won a new national award which recognises how its staff and management have worked together to grow the business. 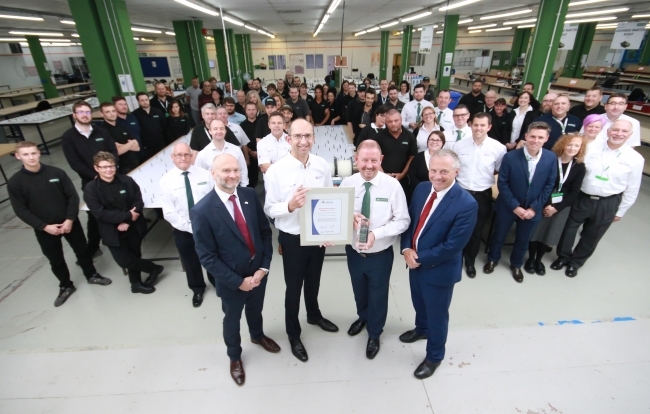 A trophy and certificate were presented to Rockford managing director Peter Lion by Andy Page, CEO of Sharing in Growth, in front of the plant’s 100-strong Worksop workforce who were also praised for their skills and commitment. Sharing in Growth (SiG) is an intensive government-backed programme designed by industry to raise the competitiveness of the UK aerospace supply chain. Rockford, which has plants in Worksop, Nottinghamshire, Rendlesham, Suffolk and Salisbury, Wiltshire, was selected for the Sharing in Growth transformation programme in 2014. Since then, with the support of Sharing in Growth, Rockford has developed its business significantly, changed its culture, created a farsighted strategy and delivered operational performance in line with world-class practices. As a result, it has secured £30 million in contracts, created 100 new jobs and increased exports to more than 50% of production. It is currently recruiting a range of roles to cope with its increased sales, including shop floor operatives, engineers and technicians and has just launched a new System Solutions Capability where Rockford is working with its suppliers to provide full systems rather than just cable assemblies or wire harnesses. The company’s new business winning strategy also includes additional investment in a concept called Future Factory in its Worksop facility, which could help move annual sales up from £16 million to £40 million and could potentially lead to another 60 new jobs. The award event was attended by VIP guests including Steve Strachan, global supply chain director, Lockheed Martin UK, one of Rockford’s key customers, John Mann MP and representatives from industry body EEF and Sheffield City’s economic development unit, Creative Sheffield. Rockford staff led a shopfloor tour that featured the many advances implemented with the support of Sharing in Growth. These included business improvement techniques, lean manufacturing cells, new communications processes, manpower planning and problem solving. More than 40 of Rockford’s staff have been awarded nationally recognised qualifications in business improvement techniques through the Sharing in Growth programme.